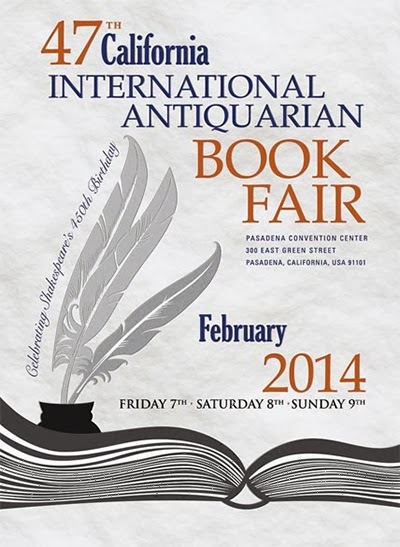 The California International Antiquarian Book Fair returns to the Pasadena Convention Center next weekend, February 7-9, 2014. Now in its 47th year, the Fair will celebrate the 450th anniversary of William Shakespeare's birth. The bi-annual Southern California rare book extravaganza brings together the world’s foremost dealers, collectors and scholars; it is now the largest such book fair in the world. This year the Book Fair will present special exhibits featuring some of the finest expressions of Shakespeare through the centuries, and a mouth-watering panel discussion on What Shakespeare Ate: Dining in the Elizabethan Age. The Huntington Library, which holds a world-class collection of early editions of Shakespeare's works, will offer an enlightening display on Shakespeare scholarship throughout the 90-plus years of its history. On view will be highlights of scholarly work researched, written, and published at the Huntington, as well as facsimiles based on Huntington holdings and items that illustrate the institution's focus on all facets of the history and culture of Renaissance England. • Early 20th Century “Hamlet” from Doves Press, the British private press that was one of the exemplars of the Arts and Crafts movement. • “The Tragedie of King Lear,” illustrated with spectacular woodcut prints by American artist Claire Van Vliet that eloquently convey the pain and drama of the play; printed in limited edition in 1986. • “R&J: The Txt Msg Edition,” this limited edition, contemporary artists’ book created by Elizabeth Pendergrass and John Hastings in 2008 presents Romeo and Juliet’s balcony scene in the form of text messages printed on accordion folded pages fitted into a retro cell phone cover that is cradled in a miniature leopard-print, high-heeled shoe. Poster images from the collections of the Margaret Herrick Library of the Academy of Motion Picture Arts and Sciences will spotlight memorable film adaptations of Shakespeare from around the world. • Photos of renowned Victorian actors Ellen Terry and Henry Irving in some of their most famous Shakespeare roles. • Original 20th century costume studies. • Prompt books with actors’ handwritten notes. • “The Tragedie of Hamlet, Prince of Denmarke” (Weimar, Cranach Press, 1930) with illustrations by Edward Gordon Craig. • Ann Clutterbuck, “Her Book.” A English family manuscript book containing recipes for foods and for medicinal needs from 1693. • Gervase Markham, “The English House-Wife” dated 1675. • Bartolomeo Scappi, “Opera…dell’ Arte del Cucinare” from 1660 which includes fabulous woodcuts of the Renaissance kitchen and all its gadgets; first time knife, fork, and spoon shown together. A related special panel on Saturday, February 8 at 1 p.m. entitled "What Shakespeare Ate: Dining in the Elizabethan Age" will further immerse Book Fair visitors into the world of the Bard. Panelists include the Pulitzer Prize-winning food critic for the Los Angeles Times, Jonathan Gold; noted food historian Charles Perry; cookbook author and founder of the Ecole de Cuisine La Varenne Anne Willan; and bookseller Ben Kinmont who specializes in antiquarian books on gastronomy. Two-time co-Pulitzer Prize winner, Los Angeles Times columnist, and NPR correspondent Patt Morrison will moderate. To be or not to be at the Fair? That is the question. But if you love books there is no question. Whether 'tis nobler in the mind to suffer the slings and arrows of outrageous fortune - fugetaboutit! Just go. You'll be glad you did.